Powerful anti-aging serum provides the perfect combination of super-peptides to maximize your results. Firms and restores elasticity to aging skin. Provides antioxidant protection while repairing previous damage. Relaxes and decreases depth of wrinkles. In ONE perfect serum! All-in-one Peptide Serum includes six powerful clinically-proven peptides in our award-winning hyaluronic acid base formula. These powerful peptides firm, repair, and protect your skin at the same time they relax and reduce the depth of wrinkles. Wish that your skin was firmer and more elastic? Pentapeptide 3 and Palmitoyl Oligopeptides (Matrixyl 3000) will significantly stimulate both collagen and hyaluronic acid production to plump and firm your skin without the irritation of similar-acting retinoids. Wish that you could reverse inflammatory aging processes that ruin skin cells ability to receive and process nutrients necessary for healthy cell growth? Palmitoyl Tetrapeptide-3 corrects the improper release of interleukins that trigger damaging inflammatory responses in skin cells. Want existing wrinkles, lines and creases to flatten out and become less noticeable? Tripeptide, Acetyl Hexapeptide-3, and GC-100 Peptide combine to not only relax surface muscle tension that causes fine lines, but also have been shown to significantly reduce the depth of wrinkles. Use before other skin care products on clean, dry skin or after Vitamin C Firming serum if you use this product. One drop of the serum will be sufficient to cover your entire face. Gently massage into skin. Use regularly twice each day for 30 days. 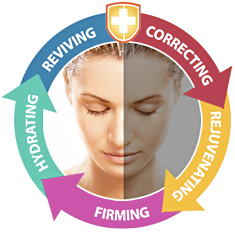 It helps firm facial contours on application, and is clinically proven to produce lasting results within eight weeks, including significant reduction in the appearance of fine facial lines, an increase in hydration and skin firmness, and progressive improvement in skin’s resilience and elasticity. It combines vegetable tensors with a soothing surge of moisture to visibly improve the appearance of time and stress-damaged skin. iLab Poly Peptide™ provides the solution to increasing cell respiration, without irritation and without discomfort. iLab Poly Peptide™ is a bio-active cosmetic ingredient derived via biofermentation process, utilizing yeast derived complex which activates and reactivates tissue regeneration through a dramatic stimulation of cell respiration. iLab Poly Peptide™ is recommended for use in skin and body care products to support the skin’s natural revitalizing capacity and to strengthen against damaging insults. Super-hydrates, increases skin’s moisture content 100% only one hours after use. Noticeably softens fine surface lines. Oil-free, non-comedogenic without making any clog pores. Dermatologist tested and approved for all skin types. Before Color Make-up, apply 1-2 pumps.